In a little and quiet street near a sandy beach, a charming and new house (2008) for your holidays. Village center, supermarket, daily farmer and bakery at walking distance as well. "We had a superb stay. The house was really lovely and great for our needs, being a family with small children." "This really is a terrific villa, which is perfectly equipped for a family holiday - everything from the crockery to the pool cover made for a very easy two weeks (they even had some toys and games in case of rain!). 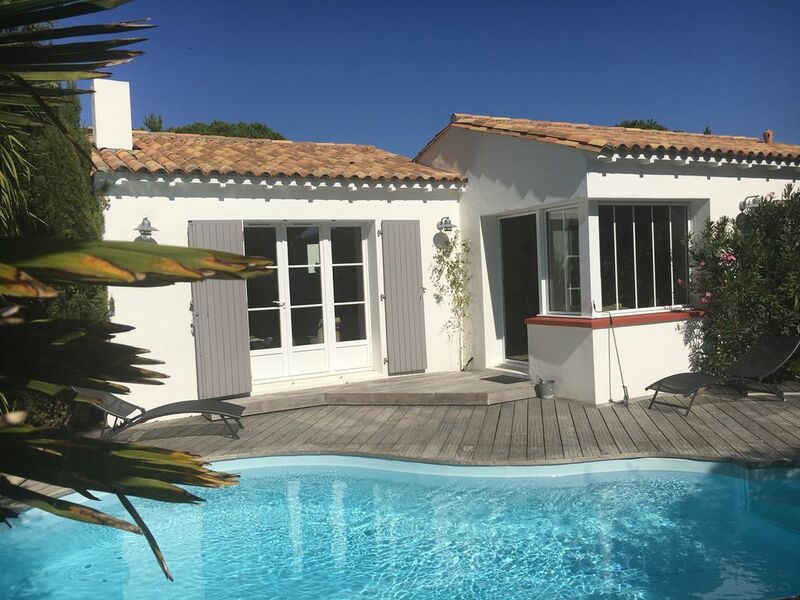 Being located just around the corner from a truly beautiful beach and a short walk from the village adds to the enjoyment of a stay at Rue de la Paix. The owners were very hospitable and welcoming and could not do enough for us so, all in all, it ticked all the boxes for a large family group." "The villa is fantastic. Very clean, beautifully furnished and equipped with everything you could think of. The garden is totally safe for children and the pool is a great bonus as it is big enough to really play in. Also, the owners are very friendly and welcoming. We would certainly stay again." "This beautiful new house provides a family holiay of luxury and confort. The owner has decorated the house in an understated style reflecting the local culture. The location of this house 100 yards from the beach and with its own pool could not be better." Maison de charme à recommander !!! Nous avons passé une semaine formidable dans un cadre verdoyant et extrêmement calme, juste à côté de la plage. La maison est décorée avec beaucoup de goût et est très bien entretenue. La propriétaire est en outre charmante et nous a accueilli chaleureusement ! A recommander fortement !! !